The results from the 2018 midterm elections are still trickling in and they look very favorably for the Democrats, a lot better than main stream media outlets are proclaiming them to be. Here in Arizona, Democrat Kyrsten Sinema has been declared the winner of the Senate seat vacated by Republican Jeff Flake. If the Dems can win the Senate election in Florida (the chance of them winning the run-off election in Mississippi are slim to none), then the net Republican pickup is only one seat. Not only that, Democrats had gains in almost every Rust Belt state that went to Trump in 2016 and it’s looking like they could end up with over 230 seats in the House. As we pointed out in our last post, Trump is rattled. He knows that with the Democrats gaining control of the House, investigations of his shadowy election maneuverings and his secretive finances will be brought to the forefront. So, in an authoritarian move reminiscent of Germany’s ‘Night of the Long Knives’ (without the bloodshed) or more recently, Nixon’s Saturday Night Massacre, he fired Attorney Confederate General, Jefferson Beauregard Sessions III. John Dean, a veteran of those heady Watergate days, even stated that Trump’s move seems like a planned murder. Trump has replaced Sessions with a shady, sycophantic automaton, Matthew Whitaker, who has openly admitted that Robert Mueller’s investigation should be shut down. Most people inside and outside of the Justice Department proclaim Whitaker to be a ‘f*cking fool’. Trump is acting like a cornered rat, so he’s sicking his fascist meat robot to do his dirty work and eliminate Mueller before any incriminating information is released to the public. But it looks like Mueller is close to wrapping up his investigation. Donald Trump Jr. has already indicated that he thinks he’ll probably be indicted. As the Atlantic pointed out, it’s probably too late to stop Mueller. Could this be the beginning of the end for Trumpty Dumpty? Excuse our skepticism, but we’ve been hearing that for a year and a half now. Trump is unhinged and his acolytes have shown repeatedly that they prefer party power over democracy and justice. We don’t doubt that the GOP will do anything and everything to obstruct, obfuscate and deceive the American public like they’ve been doing for the last two years…hell…the last fifty years. Buckle up, folks! Things are going to get very interesting. 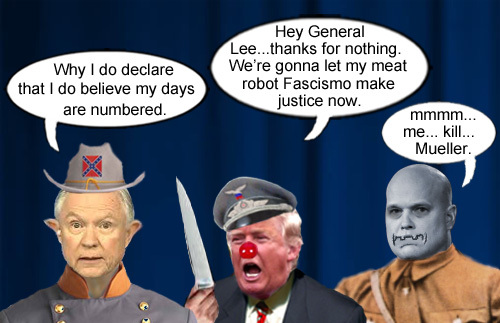 America’s CEO/Dictator, Donald Trump has decided to eliminate his Attorney Confederate General, Jefferson Beauregard Sessions III and replace him with his lackey meat robot, Fascismo, a.k.a. Matthew Whitaker.